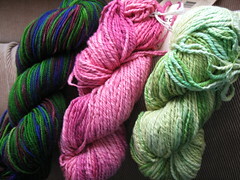 I realized I had been remiss in sharing some of my yarn purchases. I have one or two that are headed out to other folks, so I won't talk about them just yet, even if I bought a similar skein for myself. 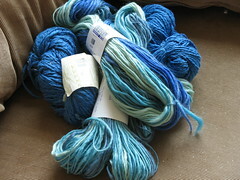 I have talked a little about my love for Nikki yarn, and you can imagine my joy when finding the LYS had a new colorway. And there just happened to be some Nature Cotton in a coordinating blue. It was like a sign!